As the rain fury abates and the flooding starts to recede in Kerala - ravaged by the worst monsoon in close to a century - the insurance industry braces up for a deluge of claims. As the rain fury abates and the flooding starts to recede in Kerala - ravaged by the worst monsoon in close to a century - the insurance industry braces up for a deluge of claims. According to The Economic Times, insurance companies have started receiving claim intimations from the state, which has witnessed massive loss of life and property damage in the past few weeks. "Looking at the initial claim intimations, we expect claims under general and life insurance to touch Rs 500 crore," an executive of a public sector insurer, told the daily. In a similar vein, a New India Assurance executive claimed that the company has received 65 claims worth Rs 35 crore in the first round of intimations and another 110 claims are expected in the second round. Several of these people, who have already initiated claims, are on vacation in Malaysia and have made the claims through emails. "We expect more people to file once they go back from relief camps," he added. Depending on whom you ask, 6-8 lakh people are stuck in 3,000-5,000 relief camps set up across the state. The death toll has crossed 300 and Kerala Chief Minister recently pegged the overall damage caused in the state at over Rs 19,500 crore. That's just the initial assessment. Insurers expect more claims to come after the water recedes from worst affected areas such as Thrissur, Chengannur, Ernakulam and Kuttanad. So life insurance claims as well as property and motor/vehicle insurance claims are going to start coming in thick and fast. Health insurers could also take a hit with likely claims from waterborne diseases as the floodwaters recede. In addition, claims are expected under the Pradhan Mantri Suraksha Bima Yojana and Pradhan Mantri Jeevan Jyoti Yojana. The daily added that many factories and stockyards are still submerged so the loss assessment on those will come in over the week. Then there is the loss on the agriculture side. The floods and landslides have wreaked havoc on the plantation sector in the hilly regions of the state, which produces spices, rubber and tea. Consider Idukki, once known as the spice capital of the world and currently one of the worst-affected districts in Kerala. Ajit BK, secretary of Association of Planters of Kerala, told PTI last week that the loss suffered by tea, coffee, cardamom and rubber planters due to the rains since the onset of the South West Monsoon on May 29 was pegged at Rs 600 crore. He added that the estimated loss of tea plantations alone was between Rs 150 crore to Rs 200 crore, with around 100 acres been lost in landslides and flooding of tea fields in Wayanad. But given the incessant rains over the past few days, the loss has reportedly mushroomed to around Rs 900 crore. But that won't impact insurers' bottomlines much. "Kerala as a state did not take large crop insurance policies, unlike other states like Madhya Pradesh," Sanjay Datta, head of underwriting at ICICI Lombard, told the daily. Insurers are also looking at writing a fat cheque for Kochi airport, which has an insurance cover of Rs 2,500 crore. But since the airport suspended operations early on, thereby limiting the damage, the claim amount is likely to be in low double digits. Meanwhile, the Insurance Regulatory and Development Authority of India (IRDAI) has already directed to life insurance companies to "initiate immediate action to ensure that all reported claims are registered and eligible claims are settled expeditiously". The regulator has also asked the non-life as well as standalone health insurers to widely publicise details of offices/special camps set up for the purpose of claim settlement. 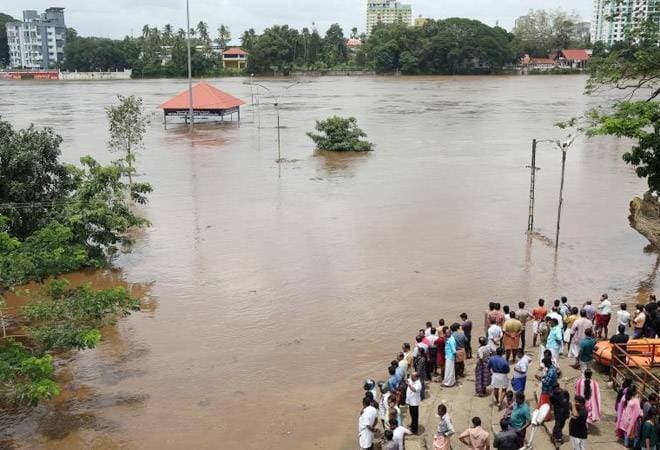 "In order to gauge the magnitude of the loss, all non-life insurers (including standalone health insurers) are advised to submit information relating to insurance claims in Kerala on a daily basis," IRDAI announced last week. With regard to claims involving loss of life, "where difficulty is experienced in obtaining a death certificate due to non-recovery of body", the regulator has suggested the insurers could consider the process followed in the case of the Chennai floods of 2015. It further directed life insurers that "a suitably simplified process/procedure including relaxations in the usual requirements wherever feasible may be considered to expedite claims settlement" and report progress on claims settled on weekly basis every Monday. This is not the first time that excessive monsoons will hurt insurance companies. In fact, floods have caused the biggest catastrophe losses to insurers in the past 13 years. Claims from the 2015 Chennai floods were the highest for the general insurance industry at over Rs 5,000 crore, followed by the Mumbai floods of 2005 (Rs 4,000-5,000 crore) and the Jammu & Kashmir and Uttarakhand floods, at about Rs 2,000 crore each. Yet given the low insurance penetration in the country, it is the common man that takes the hardest hit. Global reinsurer Swiss Re had pegged insured loss in the Chennai floods at less than 35 per cent of the total loss. J&K flood insured losses reportedly were a dismal 6.5 per cent of the total. Kerala will fare far worse, if the projected Rs 500 crore figure for claims stands - it is less than 3 per cent of the total loss so far.